I started CrossFit in December of 2008 and began coaching in June of 2009. Prior to CF, I had been active with roller derby and running. I worked out at ATC for awhile and even did a short stint with P90X. When I started CrossFit I had not even heard of it and I certainly didn’t understand what I was getting myself into. All I knew was that I was doing something different every day, it was extremely challenging, (grueling at times) and I was terrible at it. At the same time, oddly enjoyable. Go figure. I didn’t start out in an already established gym with a seasoned coach. My son (who was 15 at the time) and I did CrossFit under a personal trainer and we were his first CF clients. When I look back on that time, knowing what I know now, I wonder how I didn’t break and I certainly don’t know how I ended up loving it! The early days were rough! We have learned a lot over the years. Under the right trainer, CrossFit can be a very positive experience, especially for beginners. Despite ones background, beginning CrossFitters need to start out slowly. Learning proper mechanics and then consistency in those mechanics is imperative. While CrossFit thrives on intensity, there is no place for it in the beginning stages. Intensity will come, learning proper movement patterns comes first. CrossFit workouts are based on functional movements, and these movements reflect the best aspects of gymnastics, weightlifting, running, rowing and more. These are the core movements of life. We switch things up daily, and that keeps the workouts interesting. We hit all major and minor muscle groups and we train all 3 energy systems. I often tell people that CrossFit never gets easier, you just get better at it. We pride ourselves on GPP. General physical preparedness…for nearly anything. 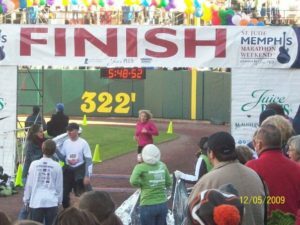 In December of 2009, I decided to test that GPP and run a marathon. It had been on my bucket list so I thought, why not? With CrossFit on my side and a few 8-10 mile runs, I ran the St. Jude Marathon. The first half felt really good and my time was around 2:15 at the 13.1 mile marker. The last half got pretty rough, as I started cramping up. I ended up with a 5:25 finish. Not a stellar finish, but a finish nonetheless! Do I recommend testing your GPP like that? No, not at all! However, CrossFit had strengthened me enough to tackle those 26.2 miles in a way I had never thought possible. One of my roller derby teammates working out a glute cramp at mile 18.